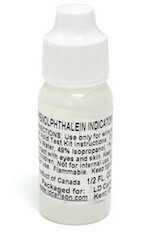 Phenolphtalein for acid test kit, .5 oz. Phenolphthalein is used when performing an acid titration test on a wine to determine the wine`s acidity level. This solution is what initiates a color change in a given wine sample when enough Sodium Hydroxide (reagent) has been added to neutralize the wine sample`s acidity.